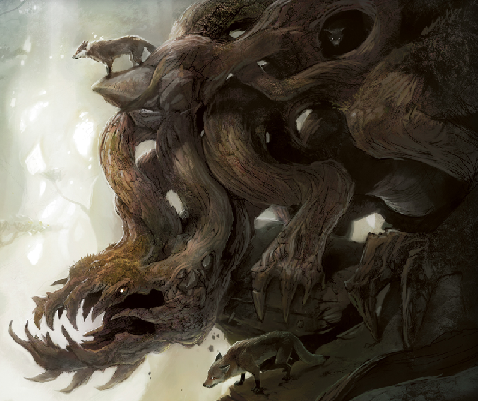 At last, our final foray into the plane of Zendikar begins! Having now covered all three sets of the block, it’s time to say goodbye in fine form, and to do so we’ve settled in to play our last three matches for the review. Natually, I’ll be piloting Brute Force, while Jimi has taken it upon herself to pilot Mysterious Realms. We’ve enjoyed reviewing the block, and hope you’ve enjoyed the journey alongside us. Here are the game notes for this final confrontation. As expected, turn 1 is a land-laying exercise, but things pick up from there almost immediately. One the play, I break the ice with a next-turn Grappler Spider, while Jimi gets an inferior Blue equivalent in Coral Merfolk. Electing to hold onto my Spider, I keep him home for the moment while getting out a turn 3 Greenweaver Druid, and the table is set when Jimi answers with a Calcite Snapper. So far, so good. I’m off to a terriffic start when my next cast is a Rumbling Aftershocks. I’m no fan of the card, but to get it before I’ve summoned a single multikicker critter has promise. The Druid has let me cast it without requiring a land drop, so it’s a perfect time to lay down my Terramorphic Expanse (which quickly becomes a Mountain). Jimi tests the waters after she plays an Island, converting her turtle and sending it in as a 4/1. Figuring no time like the present, I accept the trade for my Spider and off they go to the graveyard. At this point it still feels like I’m assembling my pieces, so the trade is a welcome opportunity. Alas, Jimi snickers as she taps three to play a replacement Snapper, and passes. The build-up marches on for turn 5, as I’m now in with a Borderland Ranger. Although up on Forests, I know they’re more in demand in this deck for its multikickers so I grab another one for good measure. Jimi sees the build-up and isn’t happy. Next turn she drops another Island, converts this second turtle and sends it in alongside her Coral Merfolk. Under normal circumstances I’d be happy to make another trade, but I’ve drawn into an Overrun and every critter I can hang on to will pay dividends later. I take the six on the chin, going down to 14. My turn 6 is a blank, but I do at least place down the Forest that the Ranger bought me. Jimi comes back into the red zone with both Snapper and Merfolk. I block the unconverted turtle with my Ranger, but permit the Merfolk to pass by. Down to 12. On to turn 7, I get greedy and make a potentially costly misplay. Drawing into a Vastwood Zendikon, I enchant one of my old Forests with it giving myself essentially a 6/4 hasty beater. Rather than send it in as I should have, I overcommit by girding it with a Canopy Cover first. This all but guarantees a response, and Jimi shows the Aether Tradewinds (pulling back her own Merfolk, a move I find puzzling until her next turn). I replay the once-mighty Forest and pass. Jimi drops a Forest of her own for her part, then converts the turtle and swings with the Snapper. Not comfortable getting so low with little to show for it, I go ahead and push my Ranger reluctantly in the path of the oncoming Snapper, forcing the trade. Jimi then solves the mystery of why she nabbed the Coral Merfolk rather than a land when she taps out to drop the Goliath Sphinx. Back to me for turn 8, I swing for 1 with the Druid, taking Jimi to 19. With a Giant Growth and Lightning Bolt in hand I’m praying she’s looking to win with a clean sheet, and she does appear to mull it over. But she’s got the right of the deck and rightly smells a trick. She moves her spindown to 19, and that’s the matter (and the game) settled. She comes in with the Sphinx, resummons the Merfolk and plays a Seer’s Sundial to boot. I then Overrun with the Druid, she lets it through so I follow up with the Growth and the Bolt to the face. She ends at 9, but it’s a symbolic gesture. The Sphinx smears me next turn. With the last match being all hat and no cattle, I’m hoping for some real substance this time. I keep a dicey draw which Jimi gets to see with her turn-1 Telepathy. So much for the Bolt/Growth surprise! Over the next few turns it’s a painful thing- I draw into land but all of it Green. I have bodies in my grip but all of them Red. When I finally manage to find a Mountain (with a turn 5 Terramorphic Expanse), my turn-6 Goblin Roughrider is little match for Jimi’s Coral Merfolk, Merfolk Wayfinder, Calcite Snapper, and Living Tsunami. Another charge of the light brigade follows as I manage to Act of Treason the Tsunami and send it in alongside the Roughrider to bring Jimi to 13 before scooping. Deja vu all over again. Third time’s the charm, I tell myself as I begin on the play for the third consecutive game, not a position I’m accustomed to finding myself often in. My keep is solid if a touch back-heavy, and I immediately regret it when my first draw gives me another of the deck’s too-abundant five-drops. Jimi’s turn-2 Walking Atlas is the game’s first critter, but I’m not far behind with a turn-3 Borderland Ranger who fetches me a Forest. Jimi’s had the devil’s own luck with Merfolk Wayfinders, and her turn-3 play is no exception (in the four games we’ve played today, she’s played it three times and pulled four Islands). She taps the Walking Atlas to play the bonus land drop. Determined not to lose the creature war this go-round, I play a once-kicked Gnarlid Pack on turn 4 after swinging in with the Ranger. Jimi returns fire for 1 with the Wayfinder, then follows that up with a Territorial Baloth. Mysterious Realms is racing me, and keeping one step ahead. A turn-5 Greenweaver Druid offers some comfort, but on Jimi’s turn she swings in for 9 after hitting a land drop and enchanting a land with a Wind Zendikon. I’m now down to 10 and in serious trouble. Relief seems to arrive in the form of a next-turn Wolfbriar Elemental, kicked three times. I’ve aready swung in with the Rager (taking Jimi to 16), and the trio of 2/2 Wolf tokens are a welcome addition to my defense. Jimi hits another land drop on her turn, then again pushes her team into the red zone. Gambling that with the size of her bruisers having a 4/4 around would better suit me than a pair of 2/2’s, I even-swap all three wolves for the Baloth and consider it a good trade. That’s when Jimi lands the Goliath Sphinx. Between the Sphinx and the Zendikon I know she has me, but I’m determined to try anyway. I drop an Overrun and look to blow her out. 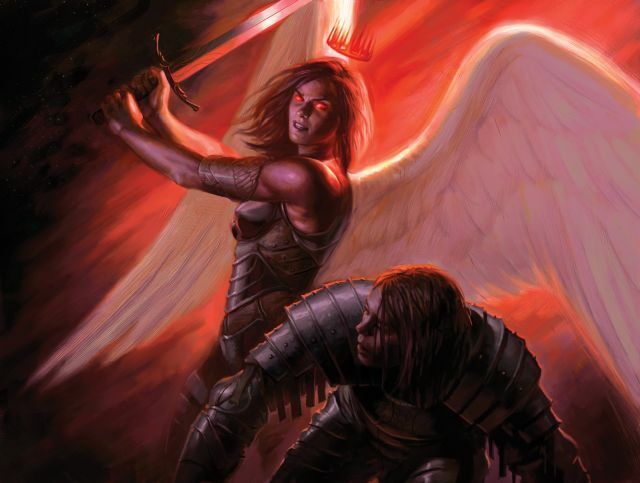 Instead, she angles her defense to that she’s left with one life, and is able to polish me off quite handily. It doesn’t escape me that had I traded the Wolfbriar Elemental and one of his wolves for the Baloth instead of all three wolves, I’d have had one more attacker and won the game. Them’s the breaks. Today’s testing greatly reinforced the feeling that one truly cannot know a deck just by looking through it, but must instead blood the deck in actual combat before rendering final judgment. I had grave concerns about the mana curve of Brute Force, it was too end-heavy despite having some ramp options (the Druid and pair of Rangers). But I didn’t think it looked all that bad. This very humbling exercise revealed the tears in the seams. Not only is the curve badly flawed (three 5-drops in an early hand is just painful), but there also seems to be quite a bit of chaff in the noncreature support. 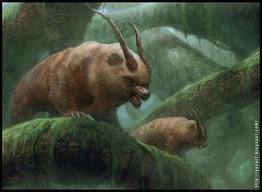 Giant Growths are great, but they need creature options to be best utilized. Vastwood Zendikons, for their part, were probably the worst drag on the curve. A 6/4 hasty beater is nice, but needs to either have other expensive cards cut to make room (yeah you, Deathforge Shaman and Rumbling Aftershocks), or have more support in the form of ramp. Add into that the lack of removal and you have a deck that needs to do its talking in the red zone. If that talking is limited to a couple of early drops, the deck has a lot less to say than by rights it should. Without looking at the screen, I’m betting on Brute Force over Mysterious Realms. I will post again after I’ve read the article. Ha ha! I’m wrong again. I can’t stand my Mysterious Realms deck. I guess my bias got the best of me. By the way, you guys have gotten into the bad habit of posting so early on the day of expected posts that on days like today I got all panicked. You’re setting the bar way too high! Aye. The championship should have taught us that. Interesting. The curve is nasty with this deck. That makes me think of a question. What does everyone think of Terramorphic Expanse when it comes to mono-colored decks? All over the net I see quite a few debates about it. Haven’t found one yet that focused on the casual side of things. The side where we can’t afford a 12 buck fetchland. Clearly, it’s not to shabby when dealing with a few colors. For mono, its a mixed bad. Sure it thins a little, but most the time a real land would almost always be better. Even if its like Emeria, the Sky Ruin or Secluded Steppes and comes in tapped. Unless I’m running a Landfall deck (and a budget one at that), I wouldn’t touch TE’s in a mono-coloured deck. The thinning is hardly worth the CITP drawback of your fetched land. Indeed. Only reason I run them in my demon deck is because of Ob Nixilis. Even then, I’m really tempted to drop them. Only need to pop Ob’s ability once in order to get it out of bolt range. Speaking of land and mana curves. Can anyone explain to me the proper land:spell ratio? As a general rule, how much land is enough land? I always feel like there is too much land with more than 20 in a 60 card deck. Insight? Advice? Links? b. Ridiculously lucky at cards and need to go to Vegas. Aye. For me it depends on my curve. If most of my creatures and spells are under 4, I run 18-20. If my curve is 4 or up, I run 20-22. Just depends on the deck. It also depends on how much ramp I have. My elf deck has Llanowar + 2 Joraga. 18 forests are more than enough based on my experience. I also run explore in the deck for a little more ramp. In my angel deck, I have a lot of lower cost cards, but my angels take a chunk of mana so I run 20 plains and 2 Secluded Steppes. My tezzy deck runs 18 lands, but again I have ramp in it. So really 24 is a good place to start, but I look at the deck as a whole. CMCs and any ramps. THe more ramp and lower CMC the less lands I have to have. It’s all a guess to you play a few games anyway. And why do we play with 60 cards and not 61-65? I mean I get why I shouldn’t be playing with my old 100-card decks from when I was 9 years old, but what makes the difference in having slightly more than 60? Or is it an issue at all? It’s a matter of minimising variance. The closer you are to 60, the more accurately you can rely upon drawing any particular card. You probably won’t notice much of a difference if you play with 62, but there’s juuuuuust enough of one that if you’re competitively playing for stakes (ie Pro Tour, Qualifier, even MNM), you’d want to reduce it as much as you can by running 60. Magic’s already plenty random as it is. Well, I see how that would reduce variance, but I don’t get to include all the cool cards I would want to play with. Then again I might never play them if I have too many cards. Oh, the dilemma of being “competitive” while wanting to have fun!